Anyway, I phoned one of the members of this particular Bad Crowd several weeks ago. (It's the ringy dingy. I can't stay away from it. It's even more addictive than that screen and the board with all the lettered buttons on it.) The Border Collie blanket was nearly done at that point, and I mentioned it. As luck would have it, she is also involved in a nonprofit that holds a fundraising silent auction, and she mentioned to me that her group would gladly accept any blankets I cared to donate. No. No. Absolutely not. I don't have time, I don't have energy. Nice try, but it's less than two months until the auction, and do you realize how long these things take? Unfortunately, the damage had been done. My traitorous brain latched onto the idea, and within a week, I had the concept, half the yarn, and a new nickname for this so-called friend: The Eeeeeeeeevil One. Well, that's it for the moment! The yellow and green blanket is done, and nearly ready to be dropped off at the nursing home. 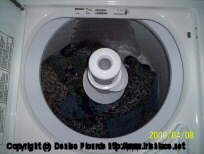 (Still needs a laundry label.) 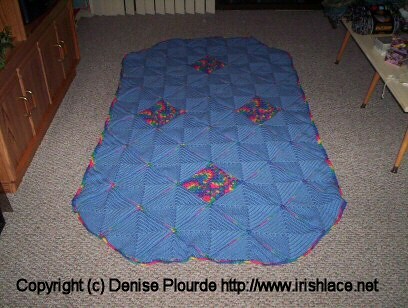 I think this is a stealth blanket, since I can't recall posting any photos of it. 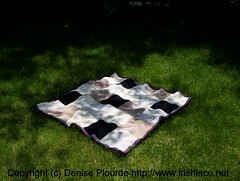 The squares for the cream and black blanket are done and are parked on my coffee table, awaiting assembly. (This is why I've made so little progress on the blue blanket. I was seduced by beige and black.) I figure it'll take me about 6 hours to assemble this and put the borders on. The border collie blanket has been picked up by my cousin. I'll take (and upload) some photos soon. Because it means that when certain people (who shall remain nameless at 3girls.us!) phone me in the evening, I can hit pause on my FOTR DVD, and spend two and a half hours assembling a blanket. And NO HEADACHE - whee! It's the blanket for the Camp Border Collie silent auction, and it is done. This is a first. I've brought yarn to the theater before, but I've usually stashed it away once the film starts. This is the first time I've crocheted during the film. I was going almost entirely by feel, ripping back when it didn't feel quite right. I haven't looked at the squares in full light yet. I'm hoping that if I leave them alone overnight, the crochet fairies will come and fix any remaining mistakes. 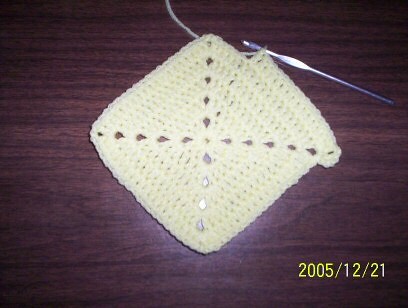 Current square status: 30 out of 30 yellow squares completed. 12 out of 30 green squares completed. 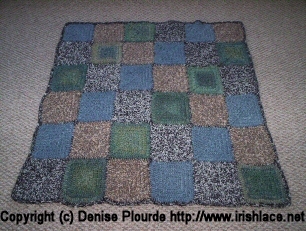 2.5 green squares consigned to the care of the crochet fairies until tomorrow morning. ETA (2006-01-09 09:30): I love those crochet fairies! 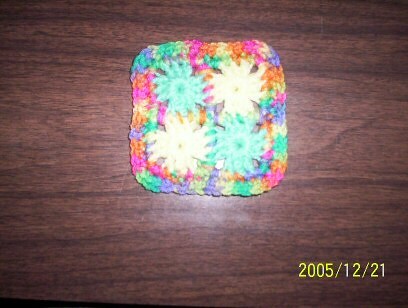 With the crocheting I did on the train this morning, I now have 16 out of 30 green squares done. How long is the PATH train ride? Yep, I managed to get that amount done on the train. Could have done a bit more, but there were times when I had to hold on, and then someone asked me what I was doing, so I had to stop and show him. I had to. Didn't I? The kitchen is starting to smell good, at least! ...for the longest it has taken me to assemble a blanket. Four months. More or less. I present to you the finished Sunset Rain blanket. An experiment in half-square triangles that turned out as well as I had hoped when I planned it, and better than I had expected when I was halfway through making the pieces. So now I need to assemble the Border Collie blanket. And then... I'm not sure. The knitting needles have been whispering my name recently. My problem is, though... I don't wear scarves; I dislike hats; I like my polartec gloves; I like plain neutral socks; and the amount of time and yarn I would need to knit a sweater for my fluffy figure is a little overwhelming. This is annoying, since I discovered recently that I am quite capable of doing row after row of simple knitting without looking at my hands. Same cheap acrylic that I use for crocheting, and yet I was surer of my movements when knitting and purling than I usually am when crocheting. Well, I somehow managed to buy three skeins of deep red yarn. 70% merino, 20% alpaca, 10% silk. DK weight; each skein weighs 50g and has 124yds/112m of yarn. So I've got 150g of yarn to justify buying. (It wasn't that expensive, really. Seriously.) I think I'm going to make a very simple 1x1 ribbing Möbius scarf. Yes. A scarf. Even though I haven't worn a scarf in 5 years. Does this seem as crazy to anyone else as it does to me? As atonement (I think), I'm hoping to go to WEBS this weekend. And they have mill ends of unmercerized cotton. Yes, it's a weaving yarn (works out to 460yds/100g), but that's actually a good thing. The dishcloths I made earlier this summer were too thick (180yds/100g), and I'm hoping that a finer thread will allow for a more useful cloth. Even a doubled thread would would work out to be thinner than the stuff I used this summer. Of course, the smallest quantity is 2lbs, but that's okay. At $5.99 a pound, I won't be going into debt over this if it fails. And, if it works, 2lbs will keep me and my mother and several other relatives stocked with dishcloths for the next few years! (And if you think that this post was inspired by a post about woolly ramen noodles, you're right! Except that this post is more about cables. My grandmother was a knitter. So is my mother, although to a lesser extent. One or both of them taught me to knit when I was a child. My grandmother, apparently, knit continental (picking). My mother knits English (throwing). I have no idea how I was taught to knit, but when I restarted knitting some months ago, I decided to use English. This is fine, except... My mother uses the pencil hold. I use the knife hold. So "monkey see, monkey do" didn't apply in my case! In other news, it's late Friday afternoon (well, 4:30pm, anyway). Last day of my week-long vacation, and I haven't done a darn thing about assembling any blankets. The squares for both Sunset Rain and Border Collie are sitting neatly, patiently on my coffee table. I should work on them. Especially since I want to hand the Sunset Rain blanket over on Thanksgiving, and that's.... 20 days away. Erk.